3 Minute Therapy Videos are designed for the general viewer, explaining key ideas in psychotherapy and counselling. Each video (except the Introduction, on the right) links to a written article on this page. The written articles go into more depth, but are still readable in 5-10 minutes. Videos will include simple talk-to-camera, visual illustrations and illustrative film clips. 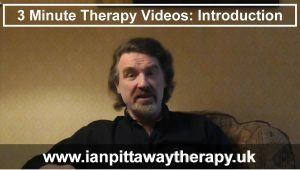 In the Introduction, Ian Pittaway, psychotherapist and counsellor in Stourbridge, West Midlands, introduces himself and the idea behind 3 Minute Therapy Videos. Click picture to play – opens in new window.